– the second part calculates the Carry Forward amount of any unused Annual Allowance available. Tax relieved pension savings will be reduced for those with ‘adjusted income’ of over £150,000 p.a. The Annual Allowance will be reduced by £1 for every £2 income over £150,000 with a maximum reduction of £30,000. This means that Annual Allowance will reduce from £40,000 pa (adjusted income at £150,000) to £10,000 pa (adjusted income at or more than £210,000). However, to provide certainty for individuals with lower salaries who may have one off spikes in their employer pension contributions, a net income threshold of £110,000 will apply. 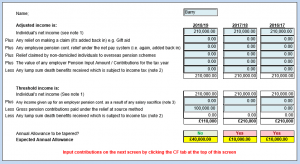 If the individual’s net income is no more than £110,000 (excluding pension contributions) they will not normally be subject to the tapered annual allowance. However, anti-avoidance rules will apply so that any salary sacrifice set up on or after 9 July 2015 will be included in the threshold definition. 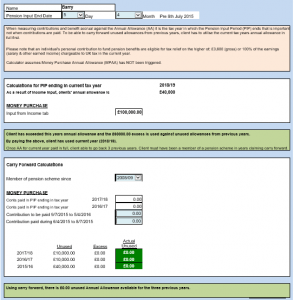 This calculator will show whether the Annual Allowance will be restricted, and the expected Annual Allowance for 2016/17, 2017/18, 2018/19 & 2019/20 which, together with the pension contributions input, will be used in the second part. Using information input on the income page, this will indicate the amount of unused contributions that can be paid in respect of a client to Money Purchase schemes for 2019/20 based upon Pension Input Amount paid in the previous years. The calculator does not cater for the input of Defined Benefit pension amounts or individuals who have triggered the Money Purchase Annual Allowance (MPAA).